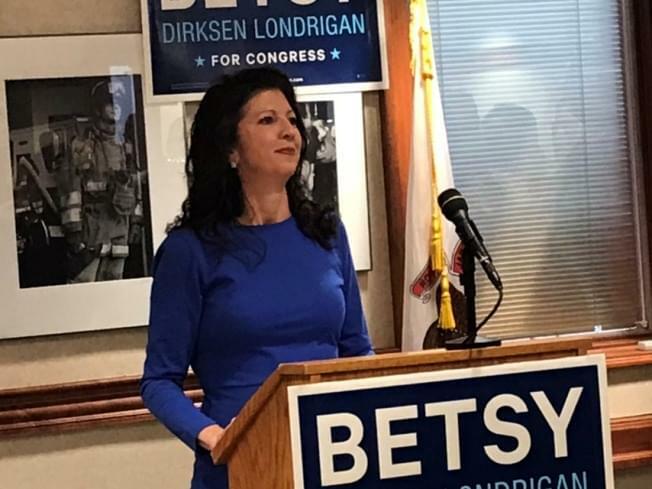 SPRINGFIELD – Launching her 2020 campaign for Congress, Betsy Dirksen Londrigan channeled her inner Larry the Cable Guy. “Let’s git-r-done,” she shouted to the applause of a roomful of supporters at the AFL-CIO hall in Springfield. Londrigan lost a close race to incumbent U.S. Rep. Rodney Davis (R-Taylorville) in 2018 and is again making health care a major focus of her campaign. Londrigan sidestepped questions about the Green New Deal and so-called “Democratic socialists,” calling herself a “Midwestern Democrat” who is looking forward to campaigning with U.S. Rep. Cheri Bustos (D-Moline), another Springfield native.